Radio broadcasting together with print media and institution of film, three important means of spreading information in Ghana, were introduced by the British during the colonial period mainly to disseminate colonial political and cultural policies. After gaining independence the position of broadcasting media and press did not experience considerable change, since they remained under the control of subsequent governments, which used them to propagate their views and opinions, at the same time restricting those of others. However, after the election of new president J.J. Rawlings in 1992 and the promulgation of a new constitution, which guaranteed freedom of speech, numerous independent stations have burgeoned throughout the country as a response to growing need of inhabitants of rural areas, where, since the level of illiteracy is high and printed media not available, radio is often the only way of providing people with both national and international news, while the entertainment needs are met by cinema vans outfitted with a projector and speakers which tour throughout the villages of the country displaying both Western and local movies and TV shows in English as well as a variety of vernacular languages. The population of the central and southern parts of the country, where the literacy rate is high, is not only restricted to listening to the numerous radio stations but can enjoy a considerable measure of both entertainment and information provided by a number of daily papers and magazines. Radio and written media, however, are not the only way of entertainment to be appreciated here due to wide availability of cinemas in urban centres: every major city has at least one, and the capital city of Ghana, Accra can boast as many as ten of them (Asante 1996:12). The change, which the Ghanaian printed media experienced after attaining independence by the country, was not the one expected by its recipients. Although newspapers and magazines began offering a choice of vernacular languages the papers were edited in the topics they raised, and the content of every issue of any publication were still controlled, this time by the Ghanaian government, which justified its actions with the need of creating unity of opinions among its citizens. According the their official point of view, allowing alternative views to be published and disseminated could hinder this process. Needless to say, governmental control over the early Ghanaian press led to a shortage of new publications since the majority of journalists saw no sense in launching a paper whose content they would have no influence on (Asante 1996:12-15). The situation changed in 1992 with the promulgation of a new constitution which guaranteed freedom of the press. Until present the following papers covering a wide variety of topics and opinions are published: daily papers the Daily Graphic and the Ghanaian Times non-daily the Independent, the Echo, the Business Weekly, the Accra Mail. Entertainment and sport issues are covered by the Weekly Spectator, the Mirror, the “Graphic Sports” and a great number of other journals. The majority of weekly publications are published in the capital city of Ghana, Accra, and distributed throughout the country together with widely read foreign publications represented by Newsweek, Time and The Economist. After gaining independence Station ZOY changed its name to radio Ghana as it was owned now by the Ghanaian Broadcasting Corporation, increased the number of programmes, and extended broadcasting for schools. To spread African pride throughout Africa, Kwame Nkrumah, the first president of the newly born country encouraged creation of the ‘Voice of Ghana’ airing shows and news in English, French, Swahili, Portuguese, Arabic and Hausa all over the continent. Most of the names of the programmes broadcast during those early days of independence conveyed the message of continental pride and freedom: Cultural Heritage, One Continent One People, For Freedom Fighters, Africa Scene (Asamoah 1985:112). Radio Ghana, however, is not the only station established by the Ghana Broadcasting Corporation. During the next years of independence two new channels, Radio 1 and Radio 2 began to air their shows, the former broadcasting programmes in local languages devoted to regional, women and youth issues, whereas Radio 2 dedicated most of its broadcasting time to commercial service, English language shows and school service since it was designed to serve an urban audience. The commercial service included social and funeral notices, and announcements from local business while the English language section aired interviews, discussions and drama. The third component, school service, broadcast programmes aimed to educate the listener including Lessons in English, French, story- telling, and music (Hachten 2001:41-43). Today both channels still operate, and are widely enjoyed by rural as well as urban audiences, and as it happened on numerous occasions in the past, are used by politicians to announce their political views and ambitions. During the 2000 presidential elections, for example, Radio 1 dedicated a considerable amount of its broadcasting time to the interviews with candidates presenting the public with their views on matters concerning the political future of the country and answering questions of listeners. Apart from that, however, their main purpose remains to educate, inform and entertain the listener, which they fulfil by airing news, educational and sport programmes as well as interviews with local sport stars and musicians (Salm 2002:78). Early-independence movie production activity was strongly limited by the lack of funds and concentrated on self-trained movie makers producing motion pictures, whose plot revolves around matter of influence of traditional beliefs on life in modern urban centres. 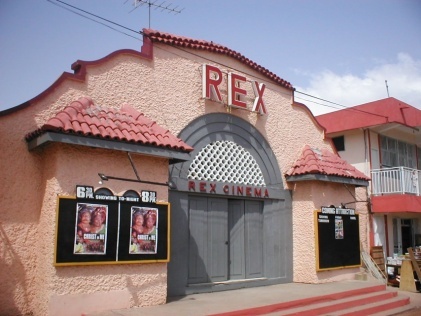 Presently, Ghanaians can appreciate a well developed and expanded movie film industry, as well as a wide range of Western movies displayed by the numerous cinemas located in the urban centres (Diawara 1992:38).